It’s hardly surprising that writers deeply devoted to the Catholic Church would reject the reasons for my decision to leave the church. The former editor of Commonweal Paul Baumann responded by suggesting that my reaction is too extreme and driven by the error of expecting too much of the church. Matthew Schmitz, a senior editor of First Things, made a related point in the Catholic Herald, implying that I and others have chosen to bolt the church precisely because it (rightly) sets its moral standards very high — and that this decision is ultimately a betrayal of our duty as Catholics to “cling” to Christ while “tending” to his wounds, and those of his church. While putting off his full argument for a future occasion, The New York Times’ Ross Douthat pronounced my choice to leave the church “a terrible mistake.” Going further, Austin Ruse took to the pages of the conservative Catholic magazine Crisis to say, in effect, good riddance: better for apostates to leave the church than to doubt its divinity and rot it out from the inside. As I say, the response was unsurprising, even perfectly understandable. Though I do wonder whether any of these apologists for the church quite grasps why I left the church — and why so many others are likely to make the same move over the coming months and years. The Catholic Church does make extraordinarily high claims for itself — not that its priests and bishops and cardinals and popes are angels but that the church as an institution is, of all the churches that follow the teachings of Jesus Christ, the one most fully and rightly ordered through time. Readers conversant with the Christian intellectual tradition will recognize that I’m talking about ecclesiology — the branch of theological speculation devoted to reflecting on the workings of divine revelation in and through the church (ecclesia). In the broadest sense, ecclesiology concerns the invisible church of all those who have followed Christ from the time of his ministry on down to the present. But it can also focus on a particular visible church within that wider communion of Christians. For Catholics, ecclesiology is often invoked in this latter sense — as a way of explaining how and why the Catholic Church should be considered the One True Church among the many Christian churches in the world. He gets RC ecclesiology wrong on this point. For one thing, it does not have an “invisible church” ecclesiology. And the RCC does not base its claim to be the one, holy, catholic and apostolic Church on the idea that it’s essentially the “best” church. Rather, the RCC makes a claim for its unique authenticity on being founded by Christ on Peter, in succession found uniquely and absolutely in Rome’s bishop, something that is not negated when it fails to be “the one most fully and rightly ordered through time.” In other words, it may be doing it badly, but it’s still the One True Church because of Christ (a claim essentially mirrored by the Orthodox, by the way). I don’t know what’s really in his heart or in the hearts of his critics, but I do think that there is a problem that isn’t being discussed as much. It’s a problem that is not the same as determining the true ecclesiology and whether a given church qualifies as the One True Church on the basis of that doctrine. I believe that it’s this problem that is a better explanation for why most people leave churches, especially in the wake of failures in leadership. What is it? It’s the problem of plausibility. What makes a doctrine plausible? We would like to tell ourselves that we believe doctrines, arguments, etc., on the basis of their logical procession from reasonable shared assumptions. But most of the time, that isn’t how we actually function. Most of the time, we believe something because we feel that we can identify with the idea and especially with the people who hold it. So when people leave the Roman Catholic Church in the wake of the (let’s face it) spectacularly awful moral failure we’ve seen on display regarding the sexual immorality scandals, or when people leave the Orthodox Church in the wake of the (again, let’s face it) spectacularly awful failure we’ve seen on display in unity in international governance and cooperation, it’s not because they have come across an argument against Catholic or Orthodox ecclesiology. It’s because the people representing that ecclesiology look like big fakes. So if they’re big fakes, then their doctrine is probably a big fake, too. How can those things they say be true when they’re such horrible people? How can I imagine myself believing and doing the things they do when I don’t want to be like them? I imagine there is probably a part of you (just as there is of me) that is thinking, “No, that’s not right. Just because someone abuses an idea, that doesn’t make it false.” And that is logically absolutely true. Abusus non tollit usum. But that doesn’t deal with the actual problem we have, which is that failures in church leadership (really, failures in any leadership) make doctrines, ideas, traditions, practices, etc., less plausible, less attractive, less compelling for those who do not have the more cerebral kind of commitment. And I think that in the case of Damon Linker, who is essentially a professional intellectual, we can also see that even such cerebral commitment is not always enough. Plausibility isn’t based solely or even mainly on logical consistency. Rather, it is essentially a variety of trust. It’s been shown, for instance, that the vast majority (I believe the figure I recall is 86%!) of people who are in church in the US are there because someone they know brought them there. So why did they come? It was almost certainly not because they had become convinced of the church’s doctrines by reading about them. That may play a part, but what got them in the door and what kept them there was that they had a trust relationship with other people who believed those doctrines and practiced those practices. This basic dynamic of plausibility explains why people are in churches, but it also explains why people are dedicated to political movements, hobbies, clubs, etc. And it also explains what is often inexplicable — why people become attached to dangerous cults, extremist groups, etc. And it also explains how people become detached from all these things and why they attach themselves to other ideas and communities. Plausibility is essentially a viral dynamic, not mainly a logical one. So, yes, I believe that we should try as much as we can to weigh truth claims and practices on their own merits. But there is something that we cannot ignore about the nearly inseparable association between doctrines and practices and those who hold fast to them. As human beings, our intellectual character is a critical part of us, but it does not stand in isolation from the networks of trust that we all rely on. That is why the most convincing people in churches are saints. And it is why the least convincing people in churches are those who cavort with demons. Holiness draws people in a way that is far more compelling than rational argument can. But if we have holiness, then our arguments will be convincing and will reveal Christ. And if we do not, then we may be driving people away from Him. 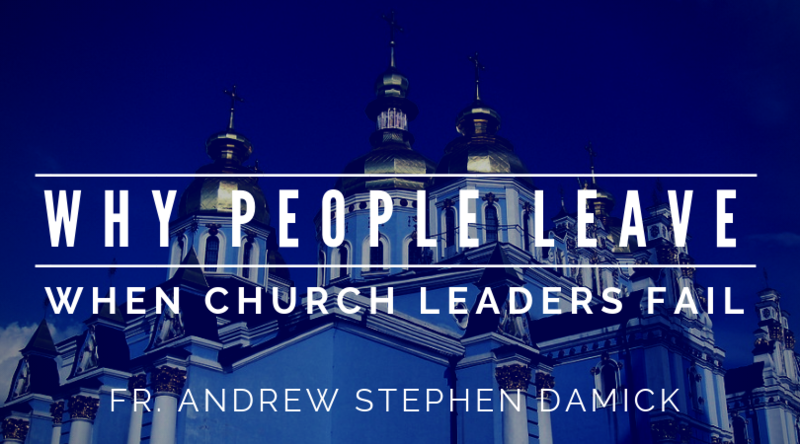 And that, I believe, is why people leave church when leaders and parishioners fail. And it’s also why people are drawn to church when they actually live what they say they believe. "Too catholic to be Catholic": Communion with Idolaters? This was an interesting article being that I know a few people who are pondering to leave their Church or have already. There are many reasons for doing so, and from the people I know, they have done a lot of research into the history which seems to have brought us where we are today and where we are now headed. Sometimes when there are bad leaders, one waits for this to be corrected and if not, a loss of respect comes into the picture. This loss affects others areas of worship also. It seems to me Jesus founded a Church having 5 in different areas, but all following the same teachings as handed down by Him & the Apostles. The Liturgy was the same only in different languages. Then, for some reason, one of them wanted to have more authority, power and independence causing them to create changes (some doctrinal; some not) which eventually created a separation between the 4 (which are together) and the one that went away more on its own. As for St Peter, Jesus was very meek and humble which makes me think He would not found a Church (with the poor as a priority) with such an elevation and status of one in power. Peter was married, and the Church was founded on his faith, not his physical state or position. Peter and the other Bishops worked together towards growth and agreements in common. There have been problems since these beginnings of separation and power which have also displayed pride and arrogance and today we have the bad fruits of that. Until the Church that went on its own re-unites with the other 4 in common, there will always be this dissention. As scripture says, “A house divided against itself cannot stand.” So, when one leaves their Church due to bad leaders, there is a whole underlying reason and history to consider. God can also be calling people to return to a more authentic way of worship that has not been watered down and minimized but instead cherished and pure. Leaders have a vocation and responsibility to keep the bad out or remove it asap, in order to protect the Church and the sheep trying to survive in it! Wonderfully stated, Father. I would add one thing: when a person’s network of trust moves beyond their fellow parishioner(s) to God, then they can hold to that trust even from within the most vicious of storms threatening it (as I see many Roman Catholics still doing, even in these times). May God have mercy and grant that we not be stumbling blocks to those around us.